Priyanka Gandhi Vadra asserts that she stands by her husband who was quizzed in a money laundering case against him. New Delhi: Sending out a strong message to the Bharatiya Janata Party (BJP), Priyanka Gandhi Vadra, Congress general secretary for Uttar Pradesh East, accompanied husband Robert Vadra and dropped him outside the Enforcement Directorate office in the national capital where he appeared for questioning in a money laundering case. “I stand by my husband,” Priyanka told reporters. Priyanka is being targeted by the BJP over money laundering allegations against her husband. The couple arrived at the ED’s office in Jamnagar House in a white Toyota Land Cruiser and was accompanied by Special Protection Group personnel. 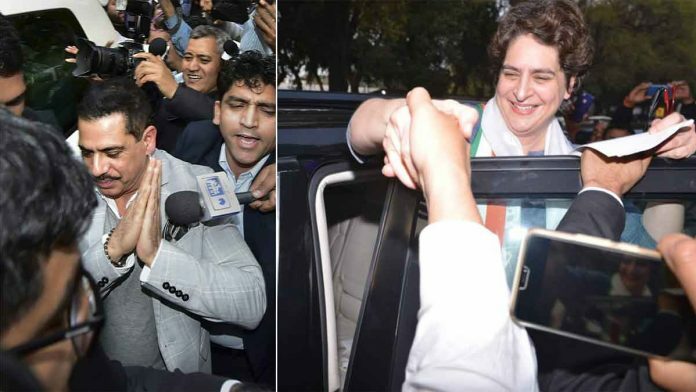 From the ED office, Priyanka left in her convoy of vehicles to proceed to the All India Congress Committee (AICC) headquarters, where she took charge as general secretary. “She met a number of workers from Uttar Pradesh state unit to discuss the strategy for the state. She will hold more such meetings later,” said a senior Congress functionary. The Congress had criticised the government Saturday over the ED raids against Vadra’s associates, alleging that the Modi government was using “high-handed tactics” to threaten people as it was in a “state of panic of the highest degree” sensing defeat in polls. Congress spokesperson Abhishek Manu Singhvi alleged that the country has never seen such a “terror raj” in the “constitutional rule” of India. “We fought the British Raj, and the BJP would do well to know that the day of judgment will come for it,” he said. The Janata government went after Mrs Gandhi, instead of doing all the things necessary to keep their ship sea worthy, complete the voyage safely.